Last August 25th, Dr. Ignasi Jürgens, ICR Medical Director, took part as a guest in the section El consultori mèdic of the El Món radio program of RAC1 Radio Station . Radio speaker: Today in the medical consulting room, we will talk about Ophthalmology. Let me introduce you to Dr. Ignasi Jürgens. Radio speaker: Welcome to El Món in RAC1. 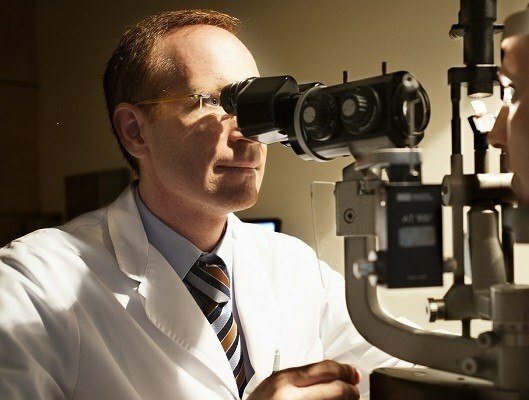 Dr. Jürgens is the Medical Director and Head of Retina and Vitreous Department at Institut Català de Retina. We usually have many doubts about things we shouldn’t do: wearing contacts for a longer time than we should, wearing unapproved sunglasses (we have heard that so many times, but we still don’t know exactly what it means), wearing eyeglasses with wrong correction, spending lots of hours in front of a screen, never going to the ophthalmologist… Dr Jürgens, how’s eye health in Catalonia? Dr Jürgens: Truth is, fortunately in Catalonia we have several prestigious ophthalmology centers, because there is a long ophthalmology tradition, with many proficient professionals in this area, which are worldwide reference specialists. Ophthalmology deals with eye care, and patients are conscious it is something we must take care of. At the end of the day, sight is what provides information to us, and people knows it is important to protect it. Radio speaker: Doctor, why do we always get wrong when using contacts?Dr Jürgens: Well, contacts give us freedom. When we wear eyeglasses we feel restricted, and with contacts we have a wider visual field. But the excessive use of contacts can cause problems. We do need to remember eye is a living tissue. And as such, if we put any object in contact with it, in this case a contact lens, when it rubs against the cornea, the cornea can suffer. Excessive use of contacts will have undesired effects especially on the cornea. Radio speaker: Now you mentioned the cornea. What more can happen if we wear contacts for a longer period than we should? And why should we strictly follow recommendations on the type of lens we have acquired? Dr Jürgens: Exactly. You talk about contact lens types, and that’s exactly the point. There are thicker and thinner lens, daily and monthly lens… The cornea, which is the anterior side of the eye, needs to nourish directly from the oxygen in the atmosphere in order to be healthy. The cornea is not irrigated with blood vessels, but instead takes the air from the atmosphere. If we use contacts, we put a barrier between the cornea and the oxygen flow from the air. Therefore, we need to restrict the cornea suffering from an extended use of contact lens by limiting its use to a certain amount of time. And this time depends on the type of contacts we wear. Radio speaker: Is it wrong to swim in the see with contacts on? Dr Jürgens: Well, it is not wrong, but if water comes into contact with the eye, this can be a problem. This means, we can carefully swim in the sea with contact lenses, but of course what we can’t do is to dive in and open the eyes under the water. Radio speaker: The big doubt that many contact lens wearers have is: is it better to use daily, weekly, or monthly contact lens? What do you recommend? Dr Jürgens: Well, contact lenses are an object that we place on the conjunctiva, in the cornea, where there are germs and secretions (the tears). Tears have a mucous component, which can accumulate in any contact lens, reason why the lens can also accumulate deposits. Such deposits are the ones we need to eliminate with the cleaning treatment recommended by the specialist who tailors the contacts. If we use a contact lens for one day and then we throw it away, the next day we put a new one and that new one won’t have any deposit. However, using monthly lens that we clean every day, despite removing most of the deposits with the cleaning treatment, is not ideal. That is to say, the more we change the contacts, the better. Radio speaker: Therefore, daily contacts are better. Let’s go to sunglasses. Some people wear them all day long. Is this harmful? Dr Jürgens: No, it is not harmful. Reasons to wear sunglasses are essentially two: for convenience, as there are people who have high sensitivity to light (photophobia) and glasses relieve such discomfort; the second reason is to protect the eye. Protection is useful against harmful sun rays: ultraviolet radiation. Ultraviolet radiation can cause eyelid skin cancer, conjunctiva problems and even corneal burns. Radio speaker: That’s why it is important to use certified sunglasses, which are the only ones capable of guaranteeing that we won’t have any problem when using them. We proceed with consultations, Dr Jürgens. Esther Pujades says: “Good morning, 15 years ago I underwent myopia and astigmatism surgery with laser technology. Now, I’m 50 years old and I’d like to know if it’s appropriate to undergo surgery again, this time presbyopia surgery. Dr Jürgens: Well, maybe we should explain what kind of techniques are currently used to correct myopia depending on age, and which ones are used for presbyopia. The most usual one for myopia is the corneal laser treatment, which modifies the shape of the cornea, as contact lenses do, but permanently. Over time, we usually suffer from presbyopia. This is not a corneal problem, but a problem in crystalline lens. Within the eye, we have a lens called crystalline lens, which has the ability to become deformed and focus depending on the distance. With the passing of the years, this lens becomes rigid and loses the ability to become deformed in order to correctly focus images (presbyopia). This lens, over time, can even get opacified and suffer from a cataract. What is happening to Esther is that her crystalline lens is becoming rigid, thus not correctly focusing on near distance. Therefore, what we need to do is not to act on the cornea, as modifying the cornea would modify distance vision. That’s why, in order to correct presbyopia, the only technique we currently have, and the most effective one as well, is the implantation of a lens within the eye. What we do is to remove the crystalline lens content and replace it by an artificial multifocal lens placed within the eye, that focuses both distant and close images. Radio speaker: So you recommend her this intervention. Dr Jürgens: Well, yes. Of course, before proceeding, we need to study the case and assess it, but the most appropriate technique is probably this one. Dr Jürgens: Exactly. Pregnancy causes very important hormone changes that affect evident structures, such as the belly. But they also may affect the eye and change refraction. Indeed, it is recommended to undergo surgery after pregnancy, and not immediately, but after a reasonable period of time so myopia is stabilized. Radio speaker: Let’s hear on-the-phone questions. Joan, from Terrassa. Good morning. Go ahead. Radio listener: Good morning, doctor. Radio listener: First of all, I am diabetic. So, from time to time, I have my eye fundus examined, in order to check that blood circulation is good, and I got laser a few times. But the symptoms I get are that whenever there is a lot of light, I must wear sunglasses, and when it is dark, I see nothing. When I go into a dark room or cinema, I see nothing. I have to fumble in the dark. Can this be fixed or does it have to do with diabetes and has no solution? Dr Jürgens: That’s a very good question. For the audience, I’d like to explain that diabetes affects almost a 15% of our population and affects vision. All diabetic patients must check their sight, because diabetes causes alterations in the retina without vision loss. So it is important to follow the screening programs that health centers and ophthalmology centers carry out to detect any cases of diabetic retinopathy. Diabetic retinopathy develops and at one point it must be treated with laser. If it is not treated with laser, it can cause intraocular hemorrhages, and even retinal detachments. Moreover, it can also cause an inflammation of the central area, the macula, which also needs to be treated. In Jaume’s case, if he has been treated with laser, laser causes scars on the retina, and makes it slightly lose contrast sensitivity, a small ability to perceive light. Therefore, it is not unusual to have less sensitivity and find it harder to see in the darkness. Additionally, the same laser treatment may cause glare and, unfortunately, there is no treatment for such symptoms. The most important is that diabetic retinopathy is stabilized and does not develop. Radio listener: Ok then, I’ll be good. Radio speaker: Eduardo, from Barcelona, good morning. Radio listener: Good morning. As I am a quite old person, over 50 years old, I’d like to raise a question. I have hyperopia and astigmatism in one eye, and myopia in the other. I don’t have many diopters, but I also have presbyopia. I’d like to know if advertisings we see and hear in the media which claim to fix all refraction problems with Aris and femtosecond lasers, and all those things we see on the media are trustworthy. Are they the philosopher’s stone? Dr Jürgens: Well, Eduardo. As you said, you have different problems (myopia, hyperopia in the other eye, astigmatism, presbyopia…). All of this, with the laser, cannot be currently treated in a proper manner. Myopia, hyperopia and astigmatism can be treated by this means. But presbyopia, and especially if you have an advanced presbyopia, it cannot. So it is the moment of looking for other solutions. Aris laser is a laser that works fine, and is compatible with such treatment, but it is always important to thoroughly study each case, as there are methods that are not indicated in a specific type of disease, and others are. I think that besides the technological tools, which are obviously highly important, it is essential to have a proper guidance coming from a specialist which can frankly determine what is more indicated for your case. Dr Jürgens: Lenses, just like we’ve mentioned before, require a specific care. So, the answer depends of how the patient takes care of his/her contacts. Some teenagers wear contacts and strictly follow the instructions. Some old people are less conscious regarding the importance of a proper care, and they don’t follow the instructions. So it depends on the person. It is important to evaluate the child, the family, and if it provides him the required support. Radio speaker: But are we talking of 3-year-old children or children of 10 years of age? Dr Jürgens: There are even cases in which contact lenses must be tailored for very small children, who have undergone congenital cataract surgery, but these are exceptional cases. A 12 or 13-year-old boy can wear contact lenses with no problems, but we must bear in mind that the sooner he starts using contacts, the lesser it takes for intolerance to appear. If we begin wearing them when we are 13-year-old, we can have problems when we are 30 or 40 years old, and if we start at our 20’s, this can happen later in life. That’s why it is necessary to speak with the family and the boy or girl. Dr Jürgens: I think this is a very interesting question, as we usually think about how sun bothers us, but not how sun can bother our children, especially when they are small children and cannot communicate. Protection from sun is always appropriate, since children are very small. Adults wear them also for aesthetical reasons, but we must keep in mind that originally glasses are thought to protect us, and this is its main aim. So it is great that children wear sunglasses, provided that they are approved and have a proper filter. Radio speaker: Let’s go to Lleida. Jorge, good morning. Radio listener: Hello, good morning. Look, my question has already been raised a few minutes ago. It had to do with intervention for hyperopia and astigmatism. But I’d like to add something more. I am a motorcycler, and the fact of wearing contact lenses, makes them become pretty dirty. Some people told me that after the intervention, the eye is weak and could be difficult for riding a motorbike. I’d like to know if this is true. Dr Jürgens: Well, contact lenses come into contact with the cornea, and anything that causes eye irritation will make it become swollen and cause problems. Over time, contacts generate small blood vessels around the cornea and, besides, they can cause reactions in the conjunctiva that make the lens become less bearable. Therefore, if we drive a motorbike, it is recommended to find a proper visor that correctly protects us from the wind. Wearing a visor resembling airtight motocross glasses would be ideal. But I understand this is difficult, but being protected against the wind is important. Radio listener: And for the intervention, does it weaken the eyes? Dr Jürgens: The problem is basically that the cornea is in worse conditions in terms of performing the intervention, as the laser intervention for myopia is performed on the cornea. Radio listener: And what about hyperopia and astigmatism interventions. This is what I suffer from, and I’ve heard the intervention for hyperopia is not as effective as the one for myopia. Dr Jürgens: That’s correct. I see you are well informed. When we modify the shape of the cornea, astigmatism gets good results, but sometimes hyperopia has a less predictive response to surgery than myopia. Anyway, both problems can be corrected. Radio speaker: There’s a flood of enquiries. We’ll finish with these three emails. Martí Puig: “What can I do to avoid eyestrain when working with a screen? I usually reduce the screen brightness and try to focus my eyes on a distant point in order to exercise them. Dr Jürgens: Perfect. Both things you do are correct. We must think that, in the first place, when we work with screens for a long time, working close to the screen forces us to make a focusing effort, and in the second place, we tend to blink less. When we stare at an object, blinking less than we normally do is a usual reaction, and this tends to dry a little bit more our eyes. Therefore, it is recommended to keep a certain distance from the screen, wear the appropriate correction and, from time to time, each 2 or 3 hours, rest for a little while, like 5 minutes, then keep working. Radio speaker: Montse says: “I have very light-colored and delicate eyes. Lately, I’ve been having a lot of rheum in the lacrimal glands. What can I do to reduce it? Dr Jürgens: Well, I think there are several things combined. Just because eyes are light-colored, that does not mean eyes need to be more sensitive. We can experience higher sensitivity to light, but the fact of having something in the lacrimal gland, that is that she has some rheum, means that there is a problem in the conjunctiva. She may have an allergic conjunctivitis caused by the gas or other elements. Her case should be assessed. Dr Jürgens: Well, this is an important question for two reasons. First of all, because it is a common trouble, and second of all, because it may be a symptom of a very serious problem. The eye is a socket which is full of a gelly-like material similar to egg white. This jelly-like substance is actually formed when we are in our mother’s belly. It is a vestige, just like the appendix, which has no use for adults. This jelly contains proteins, which over time get condensed. These condensed proteins, are what we see when we look at a white surface or the sky in a clear day. Usually these condensations are of no importance. Nonetheless, the existence of an inflammation in the vitreous, or a hemorrhage, is also possible, or any other disorder that may also cause such floaters, which drift through our field of vision, and that may be symptoms of an emerging retinal detachment or other important pathologies. Therefore, my advice is, if you didn’t see these floaters before, that you should go to emergencies in order to examine the retina. If you have been seeing such floaters for years, and you went to eye examinations which always gave good results, it is enough to have your eyes checked once a year. But whenever there is an increase in such floaters, it is necessary to go to emergencies, in order to examine the retina. Radio speaker: Thank you, doctor.